Please see the previous article at http://ponnadi.blogspot.in/2014/02/virodhi-pariharangal-14.html. sEvA in srIvaishNava paribhAshai (terms) means several things. Generally having dharshan of perumAL, i.e., seeing him is called sEvA. Offering dhaNdavath praNAms (obeisances) and performing anjali (namaskAram) is also called as sEvA. Reciting pAsurams, reading granthams are also identified as sEvA. To summarize, traditionally, any type of kainkaryam (service) is called sEvA. Many different aspects - mostly related to worshipping emperumAn at the temple are explained in this heading. 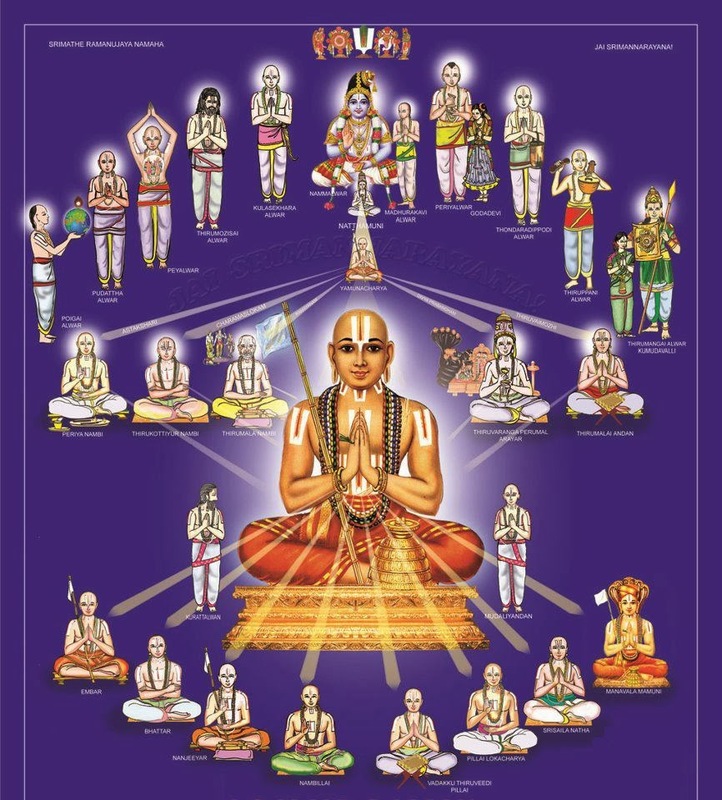 When going on a yAthrA to dhivya dhEsams, abhimAna sthalams, etc., one should not visit other places where there is no connection to (mainly archAvathAra) emperumAn. Even if we are forced to go to such places, one should simply ignore the special features of such places. Our mind should be focussed on bhagavath vishayam (matters relating to bhagavAn) only and nothing else. Translator's note: Nowadays, it is seen that while going to dhivya dhEsa yAthrA, people also visit nearby tourist attractions, shopping places, etc. It is best not to be involved in such acts when going on dhivya dhEsa yAthrAs. dhivya dhEsams are places where emperumAn himself descended into archAvathAram form with great desire to uplift every one. It is the ultimate manifestation of emperumAn's saulabhyam (easy accessibility) and mercy. One should realize the glories of such dhivya dhEsams and fully focus on performing mangaLAsAsanam to emperumAn using AzhwArs' pAsurams and AchAryas' sthOthrams. When seeing temples and towers, one should first enquire if it is emperumAn's temple/tower. If they are the temples of other dhEvathAs or avaidhika faiths, one should not offer respects. If one offers respects by mistake without enquiring the nature of the temple/tower, one should repent for such mistake and get purified. In this connection, we can recollect the following incident which is identified in nampiLLai's eedu vyAkyAnam for thiruvAimozhi 4.6.6. vaNdar and choNdar (nephews of piLLai uRangA villi dhAsar) were working as security guards for the uRaiyUr king (akaLanga nAttAzhwAn). Once when they were walking along with the king, they saw a jain temple (which structurally looked similar to vishNu temple). The king wanting to test them, tells them "Look, there is a perumAL temple! offer your obeisances now". Hearing this, they fall flat and offer full obeisances. But then they realise they have done a grave mistake - realizing that they faint at once and become unconscious. Every one becomes speechless and the king sends his personnel to bring piLLai uRangA villi dhAsar. dhAsar arrives at the place, hears what happened and applies the dust of his lotus feet on their head. Immediately both of them become conscious. Thus, we can understand that any mistake committed in relation to worshipping dhEvathAntharams, can be purified by accepting the srI pAdha dhULi (dust of the lotus feet) of srIvaishNavas. Seeing emperumAn's temples and towers, one should immediately feel great joy, offer full obeisances, get down from the vehicles (if we are travelling) and remove sandals/shoes (if we are wearing them). Not doing so is a great offense. Entering into dhivya dhEsams with sandals/shoes in the feet. At a minimum, one should atleast remove the sandals/shoes before entering the street where the temple is. Entering into the thirumALigais (residence) of AchAryas and srIvaishNavas without offering full obeisances at the entrance. Going directly to emperumAn's temple without going to the thirumALigai(s) of AchAryan and srIvaishNavas. If the AchAryan's residence is situated nearby the temple, one should always visit there, worship AchAryan and AchAryan's thiruvArAdhana emperumAn and then only go to the temple. Translator's note: AchAryan is the one who shows us emperumAn. srIvaishNavas are the one who guide us to AchAryan and explain us the great principles about emperumAn. So, emperumAn must always be approached through AchAryan and srIvaishNavas and never approached independently. nammAzhwAr highlights this in thiruvAimozhi 4.6.8 "vEdham vallArgaLaik koNdu viNNOr perumAn thiruppAdham paNindhu" (வேதம் வல்லார்களைக் கொண்டு விண்ணோர் பெருமான் திருப்பாதம் பணிந்து) - Worship the lotus feet of emperumAn who is the leader of nithya sUris, through the srIvaishNavas who are well versed in vEdham. Going into the temple without offering dhaNdavath praNams at the entrance. Entering into the temple with upper body covered with the uththarIyam (upper waist cloth). Translator's note: We are called dhAsas - servants of emperumAn. dhAsas should never put the waist cloth covering the chest (at least in front of the master). This principle can still be seen practiced in kEraLA temples, where men are suppose to remove the shirts before entering the temple and women enter the temple only with traditional clothing (saree). This is also in practice in some of the pANdiya nAdu dhivya dhEsams (south) such as vAnamAmalai (thOthAdhri), etc. Entering in-between emperumAn and the bali pItam (the place where offerings are given for parivAra dhEvathas, etc). Entering the temple in an apradhakshiNa (anti-clockwise) manner. sannidhis should be approached in a clockwise manner. Walking/Stepping on the steps directly outside the main sannidhis (inner sanctum) is not proper etiquette. We can recollect kulasEkarAzhwAr saying to thiruvEnkatamudaiyAn in perumAL thirumozhi 4.9 "padiyAyk kidanthu un pavaLavAy kANbEnE" (படியாய்க் கிடந்து உன் பவளவாய் காண்பேனே) - I will become the steps at the entrance of your sannidhi and joyfully worship your beautiful pearl-like mouth. Directly going to mUlavar (main) sannidhi without worshipping the various sannidhis around the temple. Usually thAyAr sannidhi, AzhwArs/AchAryas sannidhi, etc will be present in the pradhakshiNam. They should all be worshipped first before entering into main sannidhi of the temple. Translator's note: In pUrva dhinacharyA 23rd slOkam eRumbi appA highlights the sequence in which mAmunigaL performs mangaLAsAsanam at srIrangam temple every day. "dhEvi gOdhA yathipathi satadhvEshiNau rangasrungam sEnA nAthO vihaga vrushaba: srInidhis sindhukanyA bhUmA nILA gurujanavrutha: pUrushachchEthyamIshAm agrE nithyam varavara munErangriyugmam prapadhyE" (தேவி கோதா யதிபதி சடத்வேஷிணௌ ரங்கச்ருங்கம் ஸேநா நாதோ விஹக வ்ருஷப: ஸ்ரீநிதிஸ் ஸிந்துகந்யா பூமா நீளா குருஜநவ்ருத: பூருஷச்சேத்யமீஷாம் அக்ரே நித்யம் வரவர முநேரங்க்ரியுக்மம் ப்ரபத்யே) - Everyday, I worship the lotus feet of maNavALa mAmuni in the presence of ANdAL nAchiyAr, emperumAnAr, nammAzhwAr, srIranga vimAnam, sEnai mudhaliyAr, garudAzhwAr, srIranganAthan who is the wealth of srI mahAlakshmi, paramapadhanAthan who is surrounded by srI bhU nILA dhEvis and many AzhwArs/AchAryas(in paramapadhanAthan sannidhi). In this slOkam eRumbi appA beautifully depicts the map of srI rangam temple and the various sannidhis in sequence. It is also common knowledge in our sampradhAyam that we first worship AchAryas, AzhwArs and thAyAr before approaching emperumAn. Stepping on the shadows of the divine vimAnam (tower) of the temple is an obstacle - one should never do that. Entering into the temple without getting the permission of the divine gate keepers (jaya/vijaya, etc) is not correct. Before entering the sannidhi, one should recite thiruppAvai 16th pAsuram "nAyaganAy ninRa" (நாயகனாய் நின்ற) - In this pAsuram, ANdAL nAchiyAr establishes the proper etiquette for us to seek permission of the gate keepers before entering the sannidhi of emperumAn. Translator's note: Even before starting thiruvArAdhanam for our home perumALs, we recite this pAsuram and then only open the doors of kOyilAzhwAr (thirvArAdhanam room). Entering into the temple without seeking the permission of viswaksEnar (sEnai mudhaliyAr) is an obstacle. Translator's note: sEnai mudhaliyAr is the chief administrator for bhagavAn in paramapadham and is one of the main nithyasUris (eternal associates of bhagavAn). He is also part of our guru paramparai as our guru paramparai goes on as follow: periya perumAL, periya pirAttiyAr, sEnai mudhaliyAr, nammAzhwAr, nAthamunigaL, etc.... upto maNavALa mAmunigaL. So, it is apt to take his permission before entering the quarters of emperumAn. One should always approach emperumAn through ones own AchAryan. Translator's note: AchAryan is the who reminded our divine/eternal connection with emperumAn. One must always be grateful towards him and always approach emperumAn through him. Even while performing thiruvArAdhanam to our home perumALs, we must consider ourselves as the hands (instrument in the hands) of AchAryan and perform thiruvArAdhanam on his behalf. Entering the sannidhi right in the middle and directly without any shyness is an obstacle. One should carefully enter the sannidhi along the sides with great devotion and humility. When there is room in the right hand side, going towards the left hand side and worshipping emperumAn from there is an obstacle. Worshipping emperumAn in the crowd of samsAris (materially minded people) is an obstacle. As much as possible that should be avoided. emperumAn should be worshipped slowly from his lotus feet upto his divine head to the full satisfaction of our eyes and heart. Not doing so is an obstacle. Translator's note: The most ideal example of worshipping emperumAn is thiruppANAzhwAr. He compiled amalanAdhipirAn which beautifully brings out the divine parts of periya perumAL. In the end he declares that such eyes which have seen and relished periya perumAL will not see any thing else. That should be our attitude too. emperumAn should be worshipped with recital/remembrance of thiruppallANdu and other dhivya prabhandha pAsurams (specific to the particular dhivya dhEsam, etc) and pUrvAchArya sthOthrams (as heard from elders). We should not worship like materially minded people will do such as reciting materially focussed slOkams, etc. emperumAn should not be worshipped with the desire to get some material benefits from. Translator's note: poigai AzhwAr explains in mudhal thiruvanthAdhi pAsuram 26 - "ezhuvAr vidai koLvAr In thuzhAyAnai vazhuvA vagai ninaindhu vaigal thozhuvAr vinaich chudarai nandhuvikkum vEngadamE vAnOr manach chudaraith thUNdum malai" (எழுவார் விடை கொள்வார் ஈன் துழாயானை வழுவா வகை நினைந்து வைகல் தொழுவார் வினைச் சுடரை நந்துவிக்கும் வேங்கடமே வானோர் மனச் சுடரைத் தூண்டும் மலை) - Three types of people approach thiruvEnkatamudaiyAn - the ones who are looking for material benefits, the ones who are looking for kaivalyam and finally the ones who are looking for eternal kainkaryam. For these 3 types of people, thiruvEnkatam hill itself will remove the hurdles (to achieve what is desired by them). In this, we should be like "In thuzhAyAnai vazhuvA vagai ninaindhu vaigal thozhuvAr" (ஈன் துழாயானை வழுவா வகை நினைந்து வைகல் தொழுவார்) - the ones who constantly worship emperumAn without any blemishes. While worshipping emperumAn, mind should be fully focussed on him. Not having so is a hurdle. Mind should be fixed on emperumAn while worshipping him. It should not be like a housefly which does not settle in brand-new pot which does not have any food particles left. In temples, after perumAL thiruvArAdhanam and offerings of bhOgam to emperumAn, prasAdham is given to parivAra dhEvathAs at bali pItams. After that sARRumuRai (completion of pAsurams) is done. One should not leave in the middle (i.e., after thiruvArAdhanam). During dhUpam (incense/fragrances), dhIpam (lamp), thiruvandhikkAppu (hArathi done to ward-off dhrushti - ill-wishes), offering of bhOgam to emperumAn, etc., one should fully observe/relish such upachArams (services) to emperumAn and recite the appropriate pAsurams. Not doing so and being focussed on something else is an obstacle. Translator's note: In jIyar padi thiruvArAdhana kramam, mAmunigaL beautifully highlights how thiruvAradhanam should be performed at homes. 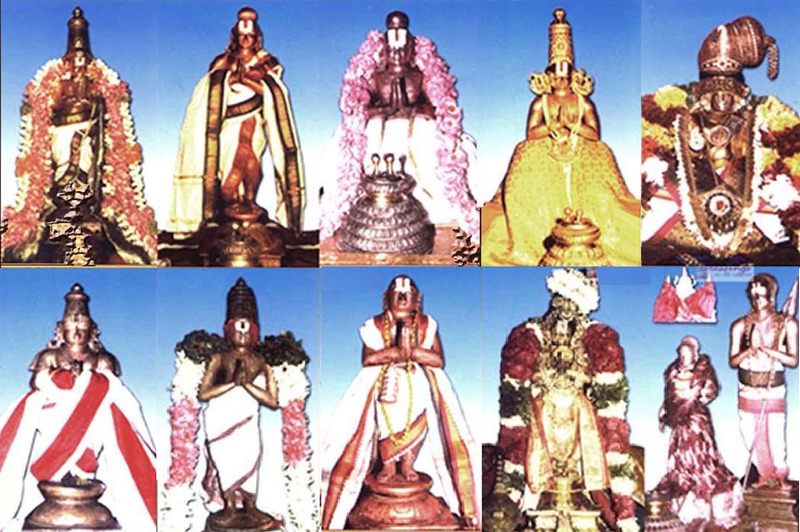 While thiruvArAdhanam is performed, srIvaishNavas usually recite many pAsurams at various times. During thirumanjanam (divine bathing), we should recite pancha sUktham, veNNey aLaintha kuNungum padhigam (decad) in periyAzhwAr thirumozhi, etc. While decorating emperumAn, for offering sandalwood paste, we should recite gandhathvAram (srI sUktham) slOkam, pUsum chAnthu (thiruvAimozhi) pAsuram. 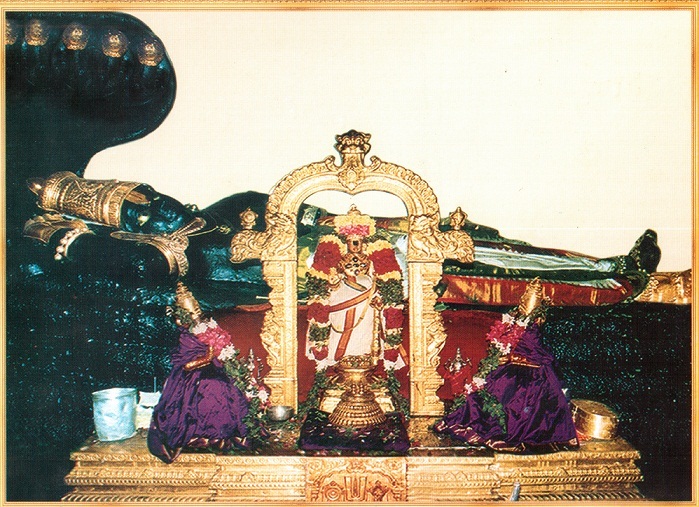 For offering ornaments and garlands, spurathkirItAnga hArakantikA (sthOthra rathnam) slOkam, chUttu nan mAlaigaL (thiruviruththam). For offering dhUpam, parivathil Isanaip pAdi (thiruvAimozhi) is recited. For offering dhIpam (lamp), vaiyam thagaLiyA (mudhal thiruvanthAdhi), anbE thagaLiyA (iraNdAm thiruvanthAdhi), thirukkaNdEn (mUnRAm thiruvanthAdhi) are recited. During hArathi, indhiranOdu biraman (periyAzhwAr thirumozhi padhigam where periyAzhwAr shows his great care for thiruveLLaRai perumAL) padhigam (decad) is recited. At temples, while the particular upachAram is performed to emperumAn, we should be fully focussed on that and be reciting the relevant pAsurams for that upachAram. One should not be focussed on materialistic dance and songs and ignore emperumAn's archA vigrahams. Seeing an oil lamp (in sannidhi of emperumAn/AzhwArs/AchAryas) dying down and not immediately fixing it and making it glow brightly is an obstacle. Please see the vyAkyAnam for srIvachana bhUshaNam 382 sUthram which discusses about lalithA charithram. Translator's note: In srIvachana bhUshaNam, piLLai lOkAchAryar identifies a purANa charithram (incident highlighted in purANas), a rat accidentally poking a wick in a lamp leading to the lamp glowing brightly takes birth as a beafuitful girl named lalithA and marries the king of kAsi. Due to her previous life's deed, she becomes very attached to lighting lamps to emperumAn subsequently. We, prapannas, do not do any kainkaryam looking for any thing in return like good birth, etc., yet we perform kainkaryam as a natural act of loving devotion towards emperumAn. Seeing dust on the floor (in sannidhi of emperumAn/AzhwArs/AchAryas) and not cleaning it immediately. nammAzhwAr says in thiruvAimozhi 10.2.7 "kadaiththalai chIykkappeRRAl kaduvinai kaLaiyalAmE" (கடைத்தலை சீய்க்கப்பெற்றால் கடுவினை களையலாமே) - ones sins can be removed by simply sweeping the floor of emperumAn's temple. Translator's note: thirukkaNNamangai ANdAn is well known for giving up everything and staying in thirukkaNNamangai bhakthavathsalan emperumAn sannidhi ever after. He was greatly attached to sweeping kainkaryam at the temple and was performing that kainkaryam regularly. In nAchiyAr thirumozhi first pAsuram itself, periyavAchAn piLLai highlights that thirukkaNNamangai ANdAN was performing the cleaning kainkaryam as the ultimate goal (not as a means to achieve something). In thiruvAimozhi 9.2.1 vyAkyAnam, nampiLLai beautifully establishes an important aspect. Here in the pAsuram, nammAzhwAr says to emperumAn "We have been doing many different kainkaryams such as cleaning the temple, etc., for many generations". Here a question arises. prapannas fully accept emperumAn as the only upAyam. They have no involvement in any personal effort - so why do kainkaryams at all? This is explained beautifully by nampiLLai through the following incident involving thirukkaNNamangai ANdAn. One class-mate (who became nAsthika) asks ANdAn why he is troubling himself by sweeping the floors if he has no involvement in self-effort. ANdAn shows him a place where there is dust and a place where there is no dust - he says the result of sweeping is just that - the place becomes clean - nothing more. He asks "Cant you spot the difference between clean place and dirty place?". Thus, we can understand that performing kainkaryam is a natural act of the dhAsa bhUthan (a servant) and that kainkaryam (service) does not become upAyam. In srIvachana bhUshaNam, piLLai lOkAchAryar beautifully explains in sUthram 88, "If a materially driven person will do so many things to fulfill his (or his dear ones) material desires, how much desire a prapanna should have to serve emperumAn who is supremely blissful and apt to be served for the true nature of the jIvAthmA?". While seeing clothes, ornaments, garlands, etc worn by emperumAn, one should relish such things one emperumAn and not think that "It will be nice if I wear them". Mouth-watering after seeing bhOgam presented in front of emperumAn before emperumAn accepts them and presents them to us as prasAdham. Translator's note: Everything naturally belongs to emperumAn and he is the one who is entitled to enjoy everything. By his grace, he consumes them and blesses us with the remnants. We should be grateful for emperumAn for giving us his remnants. Because, in gIthA sAsthram it is said that, consuming anything without offering to emperumAn is just like consuming handful of sin. So, it is a great sin to look at the food which is prepared and kept to be offered for emperumAn with the intention to consuming the same before emperumAn accepts them. stretching the legs - legs should be kept folded always. Avoiding kainkaryam to ones own AchAryan. Translator's note: mAmunigaL identifies in upadhEsa rathina mAlai a very important principle in pAsuram 64th pAsuram. He says "One can serve his own AchAryan only when the AchAryan is in this material world. Even after realizing this, if one does not serve his/her AchAryan what can we say?". One should follow the AchAryan like his shadow and serve him always. embAr is glorified as "rAmAnuja padhach chAyA" - the shadow of the lotus feet of srI rAmAnuja. We can also recollect periyAzhwAr thirumozhi ending (last pAsuram last line) "chAyai pOlap pAda vallAr thAmum aNukkargaLE" (சாயை போலப் பாட வல்லார் தாமும் அணுக்கர்களே). Translator's note: In this pAsura vyAkyAnam, there is a nice incident explained by periyavAchAn piLLai. Some srIvaishNavas approach embAr and ask him to explain the meaning for this sentence. Literal translation of this line will be "One who can sing like the shadow are dear servants of emperumAn" - but it does not look very appealing/clear. embAr says "I have not heard the meaning for this from emperumAnAr and now he has gone to meet thirukkOshtiyUr nambi. But since you have asked I have to explain this to you" and takes the sandals of emperumAnAr and keeps them on his head and meditates for a while. After a while he opens his eyes and says "Now emperumAnAr has explained me the meaning for this. You may hear. It should be taken as pAda vallAr - chAyai pOla - thAmum aNukkargaLE, i.e., one who are able to sing these pAsurams, will become like the shadow and be very dear to him".